Beschreibung:Pale yellow, centre tan; spots numerous, over 4/5 of fl, ochre orange; pollen orange-brown. Fls star-shaped, petals recurved. Stems up to 1.2m, with numerous bulbils. July. Beschreibung:Inside of tepals moderate purplish red (58A), with a large patch of greenish white (155C) in basal one-third, solid along and beside midveins but with long, feathered edges; throat red-purple. Outside of tepals greenish purple. Spots few, small, round, dark reddish purple, mostly scattered over white patch on each tepal; papillae absent; nectaries light greenish yellow (1C); filaments whitish, tinged rose pink towards anthers; pollen moderate reddish brown (166B); style reddish pink; stigma light greenish yellow (1C). Fls 200mm wide, not scented; tepals 125 × 40mm, margins smooth or very slightly ruffled, tips straight or very slightly recurved. Lvs scattered, 140 × 20mm, dark yellowish green (139A). Stems 1m, 139A, with up to 10 fls. July. Published in Europäische Liliengesellschaft sales list (2010) Named after the hybridizer's daughter. Beschreibung:Inside strong purplish red (60D), with a light green throat, outside strong purplish red (60C); very small, deep red (60A) spots on the inner half of each petal; nectaries frosted; pollen moderate reddish orange (171A). Petals 105 x 35mm, not ruffled, slighty recurved. Lvs alternate, 120 x 25mm, dark green. Stems 1.25m, rather dark green, with c10 fls. Early July. Beschreibung:Light yellow to cream; throat yellow-green, tips lighter cream, outside yellow-green, margins deeper yellow-green; slightly spotted; nectary green; pollen light tan. Lvs dark green. Stems 1.0m. July. Beschreibung:Tepals moderate red (181A); midveins pale yellow (158B); throat flushed salmon pink. 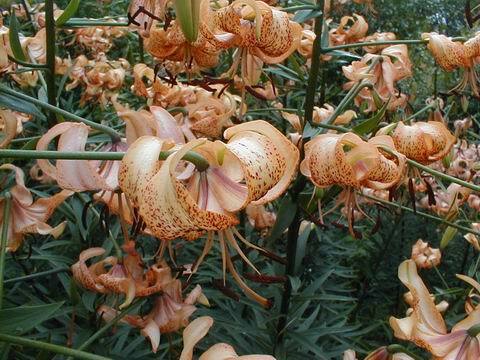 Spots fairly numerous, tiny, brown, evenly scattered, mostly over lower half of each tepal; papillae sparse, pinkish white; nectaries soft pink, becoming white with age; filaments long, slender, tinged pale rose-pink towards large anthers, pollen strong reddish orange (169A); stigma beige. Fls 140 mm wide; tepals 70 x 42 mm, margins smooth, tips recurved; pedicels dark. Lvs scattered, 92 x 16 mm. Stems 0.9 m, light green, but shiny red-orange where pedicels join the stem, with 9-10 fls. Mid- to late July. Nomenclatural standard: colour print supplied by registrant (WSY 0100433). The name means "Eva's Dream" in German. Eva is the first name of the hybridizer. Beschreibung:Yellow-Orange 14A, throat 23A, outside Yellow 13B; with very large brown spots; nectary Yellow-Green 154B; pollen brown; petals ruffled. Lvs wide. Stems 1.0m. July. Beschreibung:Tepals, including throat, brilliant yellow (15C); inside with a very narrow, dark maroon, picotee margin in basal quarter. Spots sparse but conspicuous, fairly large, round to elliptic, dark purple, scattered over the basal quarter of each tepal; papillae absent; nectaries orange; filaments flesh-coloured to orange; pollen vivid orange (28B); style greenish yellow; stigma moderate red (180C). 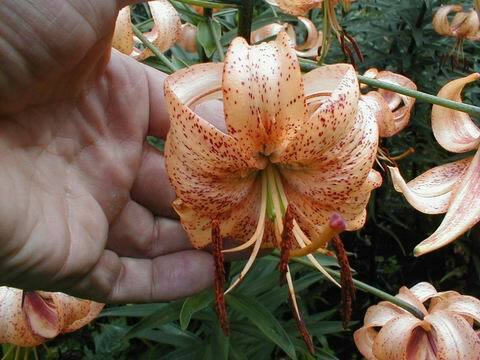 Fls 80mm wide, not scented; tepals 80 × 30mm, margins smooth, tips strongly recurved; with secondary buds. Lvs scattered, 110 × 16mm, moderate olive-green (137B). Stems 1.3m, 137B, pubescent, with bulbils, with up to 15 fls. July. Published in Europäische Liliengesellschaft Lilien-Info No.2: 24 (2001); picture p.25 The Havel river passes through Berlin, near which the hybridizer lived at the time he made this cross. Beschreibung:Inside of tepals, including throat, vivid reddish orange (34B). Outside of tepals strong yellowish pink (31C). Spots few, very small and feint, purple, in basal one third of each tepal; papillae absent; nectaries green, frosted silver; pollen vivid reddish orange (30A); stigma dark red (59A). Fls 100mm wide, not scented; tepals 75 × 38mm, margins smooth, tips strongly recurved. Lvs 110 × 12mm, scattered, moderate olive-green (137A). Stems 1.6-1.8m, dark red (187A), with up to 15 fls in racemose infl. Early July. The epithet, meaning "high light" in German, describes the cultivar's bright flowers on a high stem. 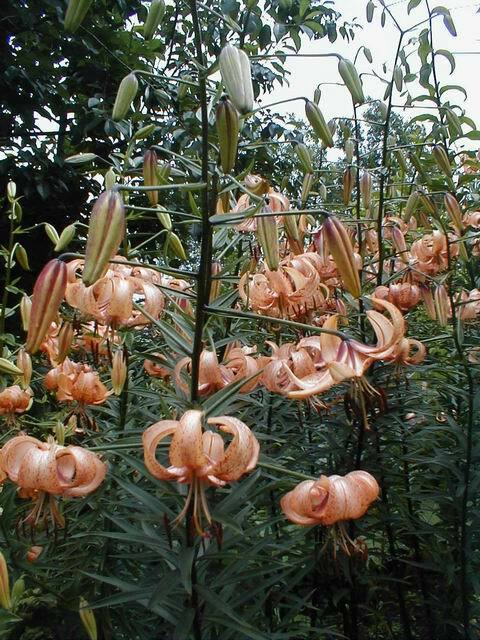 Beschreibung:An unregistered cultivar, bred by Dr Giffei to form long pedicels. Lost to cultivation (along with many other Asiatics) during the winter of 2011-2012. Beschreibung:Inside of tepals moderate red (181A), flushed brilliant yellow (20A) in an arc mid-tepal at the top of and above the spotting; throat dark red (187B). Outside of tepals moderate red; tips green. Spots numerous, variable in shape, most coalescing to form short dashes, dark red (187B), densely and evenly distributed over up to one-half of basal portion of each tepal; papillae rich reddish pink tipped rosy white, either side of nectaries; nectaries conspicuous, long, linear, silvered pale mauve-pink; filaments red; pollen moderate reddish orange (171A); style red; stigma dark purple. 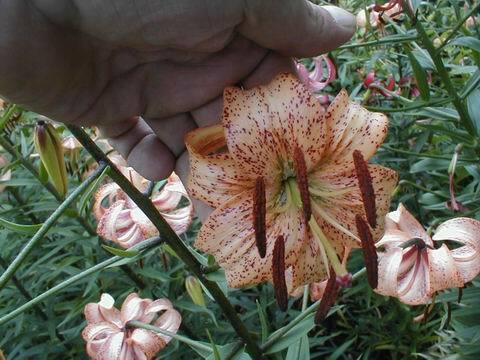 Fls 150mm wide, not scented; tepals 85 × 40mm, margins smooth, tips straight or (very) slightly recurved; pedicels 150mm long, dull olive green; with secondary buds. Lvs scattered, 110 × 20mm, dark yellowish green (139A). Stems 1.4m, 139A, with up to 20 fls in a long raceme. July. 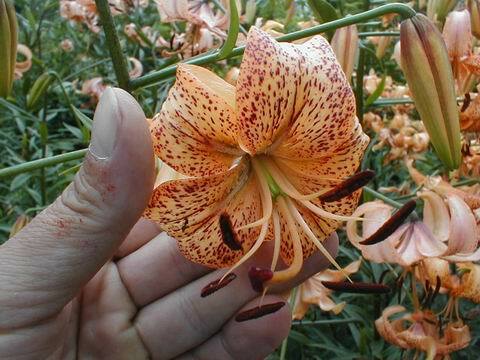 Published in Europäische Liliengesellschaft Lilien-Info No.2 (2009) Named after the Latvian breeder Janis Vasarietis. Beschreibung:Cream and orange; orange throat, tips and outside cream; spotted; nectary light yellow-green; pollen light brown. Stems 1.0m. July. Beschreibung:Yellowish white (158D) throughout except for a green suffusion in the throat; many, large, very conspicuous, dark red (59A) spots over all but the tips of each petal; nectaries very pale green (130D); pollen deep red (185A); stigma deep purplish red (187D). Fls 140mm wide; petals 65 x 27mm, not ruffled, distinctly recurved. Lvs alternate, 65 x 10mm, mid green. Stems 0.7m, rather dark green, with up to 8 fls. Mid July. Beschreibung:Blood red. Stems 1.0m. July. Beschreibung:Yellow 12B, shaded Yellow-Orange 21C in centre; spotted brown; pollen orange-yellow; petals hardly recurved. Lvs bright dark green. Stems 1.2m. Late July. Beschreibung:Tepals and throat vivid yellow (9A), inside of tepals with a large patch of dark red (187C with 187A veining) above nectaries; midribs striped strong yellow-green (144C). Spots dark red (187A); papillae absent; nectaries strong yellow-green (144B); pollen moderate reddish brown (175A); stigma dark red (187B). Fls 150mm wide, tepals 70 × 40mm, margins smooth, tips recurved. Lvs 115 × 10mm. Stems 1.25m, green with darker markings, with up to 8 fls. Beschreibung:Inside apricot-orange, darker around nectaries, base of throat paler; outside pale orange, midribs pale yellow-green; spots many, large, dark brown-crimson, over half of each petal, papillae in throat; nectaries white-granulated; pollen red-brown; stigma pink-brown. 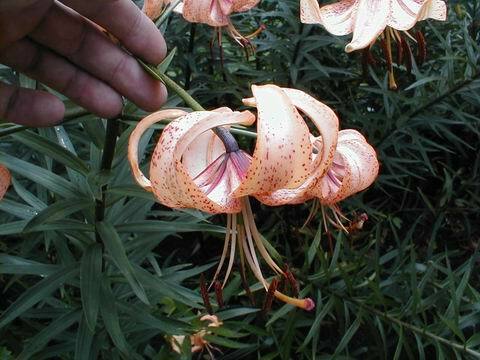 Fls 130 mm wide; petals 90 x 45 mm, margins slightly waved, tips scarcely recurved (the outer more so); pedicels 60 mm long, thick, profusely brown-dotted. Lvs alternate, 145 x 21 mm, dull dark green. Stems 0.85 m, very thick, profusely brown-dotted. Mid July. Diese bereits seit Jahren bewährten und weltberühmten Hybriden mit L. langkongense von Dr. North/Schottland werden in diversen Listen von Mitgliedern der ELG angeboten (bei den ersten ist die Zuordnung noch nicht sicher, die Blütenanzahl bezieht sich auf 2004). Weitere Details über die North-Hybriden fanden Sie unter chrisnorthlilies.org. North-Hybriden im Garten von Norgart Martschinke (12.07.2004). Beschreibung:Dark red throughout with some darker red spots; nectaries dark red; pollen brown. Petals not ruffled, strongly recurved. Lvs alternate, 110 x 8mm, dark green. Stems 0.65-1.0m, with 5-7, slightly scented fls. Midseason. An allotriploid. Beschreibung:Orange-White 159A, flushed purple at tips. 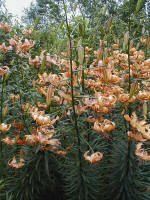 Stems with 20-30 fairly small, scented fls. July. 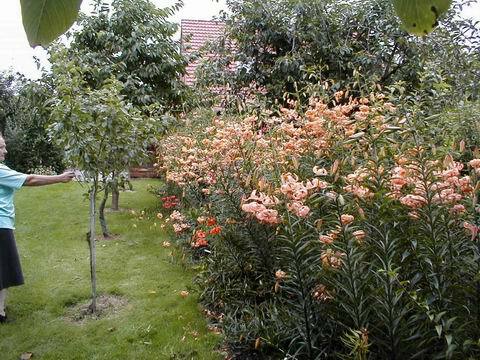 Beschreibung:Pink; fls scented. Stems medium height. Sterile triploid. Beschreibung:Tips Yellow-Orange 23D, throat 23D to Orange 25D, margins and some papillae Orange 24A, outside 23D flushed ± Greyed-Orange 166B at base; copiously spotted Red 53A in lower 2/3; nectary Yellow-Green 144B; pollen Orange-Red 34A. Petals 70 x 19-27mm, not ruffled, strongly recurved. Fls 60-70mm wide. Lvs alternate, the upper 110 x 12mm, dark green. Stems c.1.6 m, green, flecked greenish brown, with 8-48 fls. July. 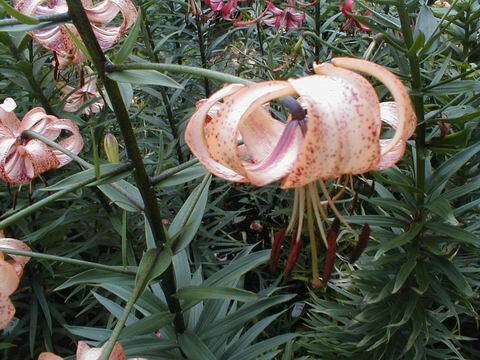 Beschreibung:Orange pink inside, orange pink with dark stripe along midvein of each petal outside; few dark pink spots; nectaries orange pink; pollen dark brown. Fls 80-90mm wide; petals 75 x 19mm. Lvs alternate, 128 x 14mm. 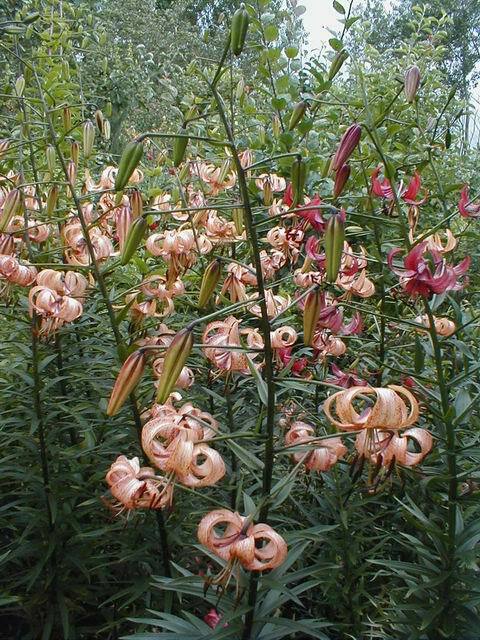 Stems 1.35m, dark reddish, with 16-20, slightly scented fls. Midseason. An allotriploid. Beschreibung:Pale mauve pink, deeper in throat, dark red on outside; dark red spots mainly towards centre of petal; nectaries reddish; pollen dark red. Fls 70mm wide; petals 76 x 24mm, not ruffled, strongly recurved. Lvs alternate, 94 x 10mm, dark green. 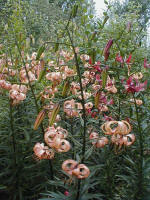 Stems 0.7-0.75m, dark red, with 15 or more, slightly scented fls, occasionally with bulbils. Midseason. An allotriploid. Beschreibung:Orange ochre inside, orange outside; few dark ochre spots; nectaries orange. Petals 74 x 29mm; not ruffled, strongly recurved. Lvs alternate, 120 x 1mm, midgreen. 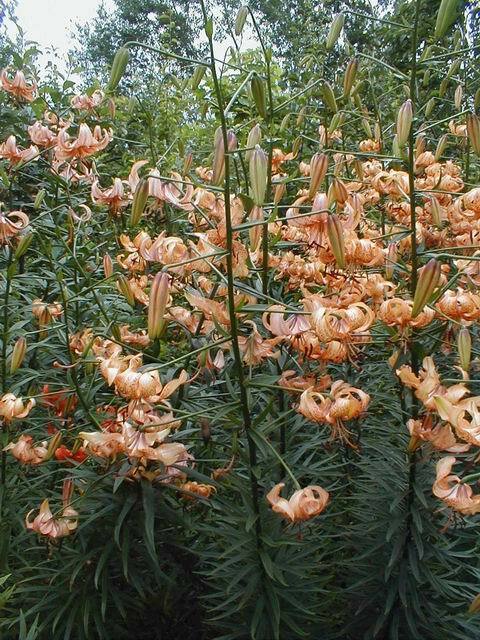 Stems0.9-1.0m, with 12 or more, slightly scented fls. Late-midseason. An allotriploid.